Not the best photo by a longshot, but a good opportunity to share something I saw when we went to the county fair a month ago. Yes, that is a sign advertising a glazed doughnut chicken sandwich. Two Krispy Kreme glazed doughnuts, with a deep fried (I'm assuming, because why would you grill?) chicken patty in between. With cheese, no less. No, I didn't try it. But you know what? I really wish I had, just because that's such a county fair-type thing to eat. 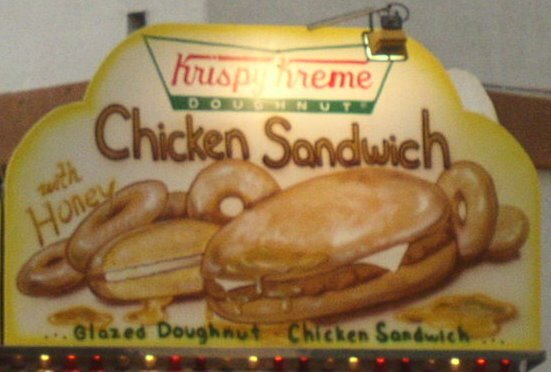 Deep fried Snickers, deep fried Twinkies, why the heck not a glazed doughnut chicken sandwich? Oh well, there's always next year. Maybe I should start training for it now... run laps, strengthen my heart, clear my arteries, and otherwise prepare my body to ingest such interesting and unique fare. oh my god..! I've never seen that before. I wish you had tried one just to say what it was like. Wow! That looks lethal. The other night I was watching the food network and they were making fried butter. I could not believe my eyes. They froze the butter, scooped it into little balls, rolled it in bread crumbs and then fried it. I got to your site via whiplash & had to say I LAUGHED OUT LOUD at this entry. How funny....need to go into training.... I would've tried this without a second thought - the sole reason I go to fairs is for the crazy fried food snacks (deep fried milky ways my current fave). Although I have to hide this fact from my kids so they can grow up with better eating habits than I.